1.Cut pomegranate into quarters; submerge into bowl of cold water and carefully remove the pomegranate seeds. Reserve 1 cup seeds; in blender, purée remaining seeds. Strain purée through fine-mesh strainer reserving juice; discard solids. 2.In small bowl, whisk together honey, 1 tablespoon pomegranate juice (reserve remaining juice for another use) and ginger. 3.Slice off top and bottom ends of orange; place cut side down on cutting board. With small paring knife, slice down the sides following the natural curve of the orange to completely remove skin and white pith. Turn orange on its side; cut into 1/8-inch slices. 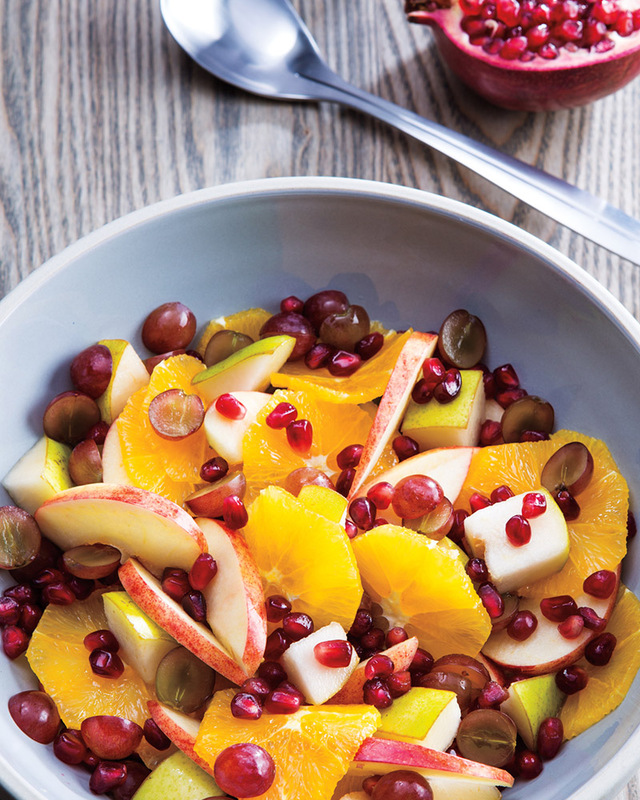 4.In large bowl, toss apple, pear, grapes, remaining pomegranate seeds and orange. Makes about 7 cups. 5.Divide salad into 6 serving bowls; evenly drizzle each with pomegranate honey to serve.